Just southwest of the Reserve Street Bridge, a homeless community resides in makeshift shacks and small tents on the floodplain of the Clark Fork River. During summer, as many as 20 people live in the encampment. But with winter moving in, some campsites have been abandoned. Others still show signs of life, along with clotheslines, campfires and bike repair shops. 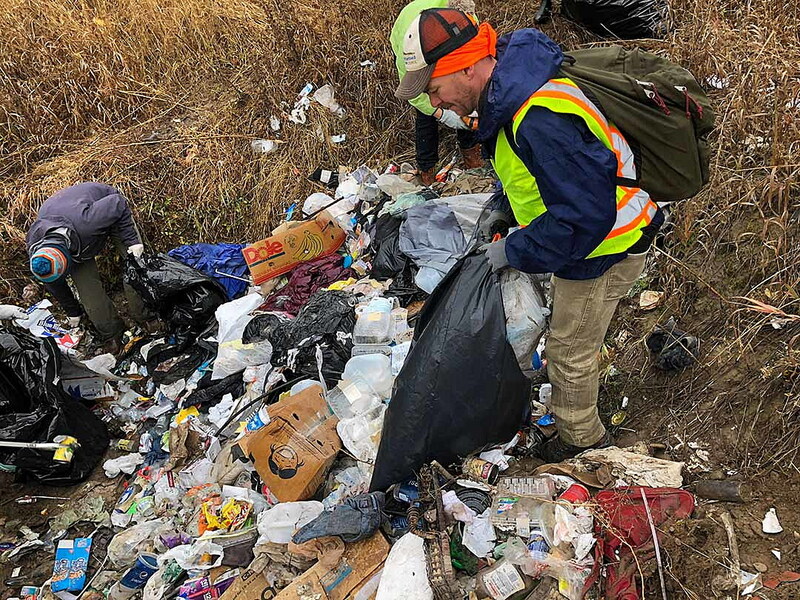 Volunteers from the Clark Fork Coalition, Missoula Valley Water Quality District, the Open Aids Alliance and other local organizations came together Tuesday to clean up trash left in the camps, lest it be washed into the river by spring’s high water. The annual cleanup has taken place for the past seven years, said Travis Ross, an environmental health specialist with the Missoula City-County Health Department’s Water Quality District. Plastics and human waste can become a concern when springtime flooding occurs. About four to five tons of trash is removed from the area each year. Last year, independent contractors removed about 20 tons of trash from the site, including shelters. This year for the first time, owners of the land – refrained from breaking down shelters. Those who plan on staying through the winter bear white sheets of paper with the word “OCCUPIED” stapled to their shelters. 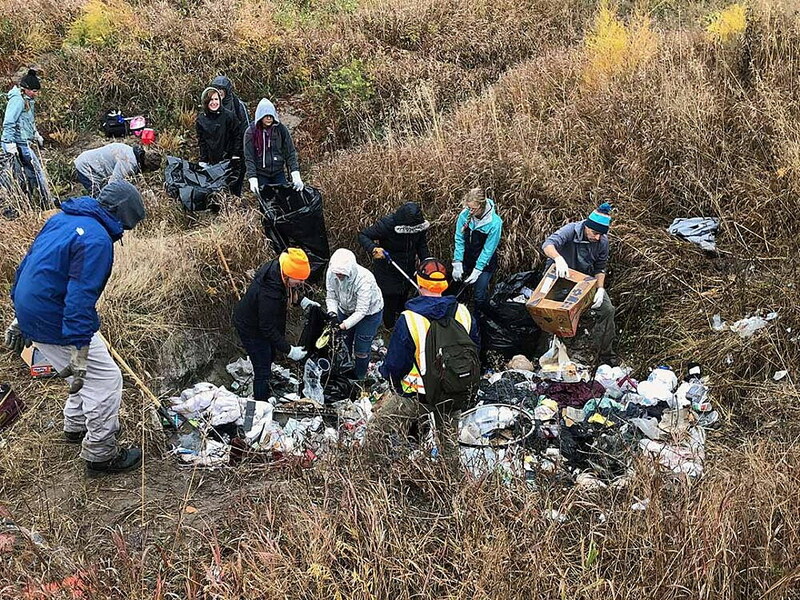 So on Tuesday, about 25 volunteers began collecting litter across the 60 acres of land, using shovels to dig out piles of garbage from several impromptu landfills. “This year, we’re just trying to get the loose trash; that’s our goal,” Ross said. The land is owned by the Montana Department of Transportation, Daily’s Premium Meats and the city of Missoula. Ross said that who has responsibility for the site’s cleanup is murky, with property and jurisdictional lines in question. “Some of this land is within Missoula city limits where camping is prohibited. Then there is county jurisdiction as well, and the county doesn’t have a camping prohibition,” Ross said. 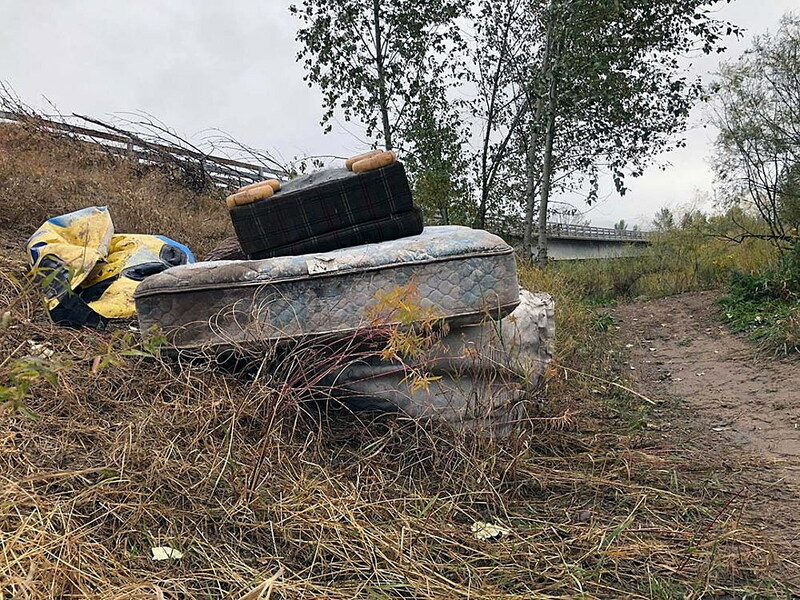 John Brock, a volunteer with the Clark Fork Coalition who participated in the cleanup last year, said that the homeless don’t have many options and find this area to be safe and isolated away from prying eyes. Compassion is one reason for allowing people to stay. “There’s no place to go and this may be the best that can be done right now. So if there were more places for people to go, more houses and things like that, this may not be so necessary,” Brock said. Hannah Higgins, a member of the Poverello Center’s Homeless Outreach Team, said that while she wasn’t sure if there has been an increase in people staying at the site, more people who have been affected by cuts in case management programs and a lack of affordable housing have resorted to living by the river. The HOT Team visits the camp once a week for two hours, making sure people are fed, warm and have clean clothing. Helping people get into a place to stay is also a goal, Higgins said, but many find it hard to locate overnight resources due to capacity limits in shelters like the Poverello. Trauma, loss of familial and marital relationships and a lack of affordable housing are the main issues these homeless residents experience, she said. According to the 2017 Missoula Housing Report, Missoula has seen a decrease in the number of people experiencing homelessness according to a Montana Point-In-Time Survey. In January 2016, 395 individuals and families were experiencing homelessness in Missoula, which was lower than the five previous years. While the city works toward solutions for homelessness, there isn’t a clear one for keeping the Reserve Street area clear of trash. Annual cleanups are expected in the future, Ross said.